The voting between the first two contenders Lakshina Rodrigo and Raveen Sayer have been fluctuating with Rodrigo and Sayer changing the lead from time to time. There are two more new entrants joining the Platinum Contest last week. It was Ruchira Pupulewatte of Dharmaraja College, Kandy and the latest addition being Harith Maduwantha of D.S. Senanayake College with 296 votes against his name. 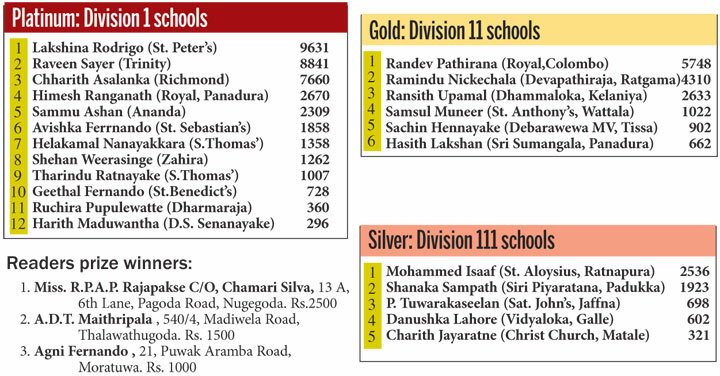 In the Gold Segment for division 11 schools Randev Pathirana (5,748) of Royal College, Colombo is well ahead of Ramindu Nickechala (4,310) of Devapathiraja College, Ratgama. This year Royal College, Colombo has to compete in the Division Two in the Sri Lanka Schools Cricket Association competition.